Hugh's tutorial is great, but my '74 fork internals look nothing like the "early"-style Hugh shows in that post. My dampers are as shown in post #8 above. Rubuilt my forks twice again this morning, test-driving between each, with the damper washers, rod, and piston is various configurations. I can only seem to make it worse, not better. But it ended up shortening the over-all length of the assembled fork by about an inch and a half compared to the other yet-to-be-disassembled fork. One of the seals looks pretty good, and neither leaked in the 3,000+ miles I rode last summer with fresh fork oil added, so I’m thinking at some point someone replaced the seals, and perhaps re-assembled them incorrectly. I looked online for exploded views and re-read every fork thread I can find, and I can not find any info specific to this. I have both new seals in the fork lowers. I just need to tighten them up and add oil and I can throw them back on the bike. I just need to know which configuration is correct for 77 forks. Any help would be appreciated. Thanks skull! I did not read this thread before, and correct me if I’m wrong but it would appear that perhaps my forks have NOT been previously dissassembled, but maybe someone pulled a shadetree fix and added the smaller valve springs at some point. My question now is this- when they are being called “valve springs” are we talking like the actual engine tappet adjuster springs? 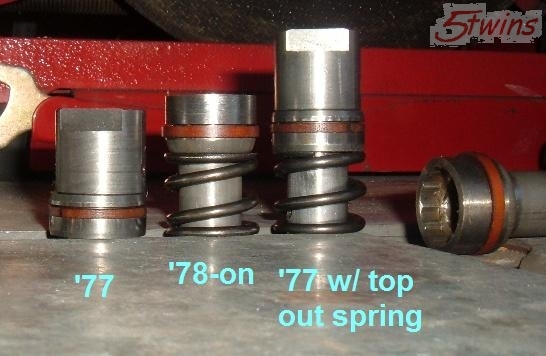 The parts manuals call it a rebound spring. It should be assembled like your second picture, on the damper rod. Some people call the damper rod a valve -- it does act as a valve, it has holes that fork oil flows through as the forks travel, dampening the action. Do a search for the "Minton Mod" while your forks are still disassembled. It is a simple modification that will significantly improve handling. Your forks had to have been apart in the past because someone added that little top out spring. '77 forks didn't come with that. The spring on yours doesn't look like an original top out spring, it looks longer. It could very well be an engine valve spring. The original top out springs are about 22mm long. They compress about half way when the forks are assembled so that lowers them about 11mm. Your added springs are probably too long if they're shortening the forks an inch or more. I would cut one in half and use half in each fork. I like the idea of adding a top out spring to the '77 forks. They "clunk" upon full extension in their stock form without one. I also like the way this lowers the forks internally by about 3/8". I usually raise them in the trees a little bit anyway but this does the same thing without having to. One more note - fork springs should be installed with the tight wound coils on top. Don't know why, that's just the way the manual says to do it. And if you want to stiffen up the fork springs without having to buy new ones, cut new top spacer tubes 1" longer than the originals. Measure the free length of your springs. Stock '77 springs were about 472mm long. Dropping the forks 1 1/2" could be a bit much. The slight lowering many of us do only amounts to about 1/2" at most. Like I said, I'd just use one of your longer top out springs cut in half.